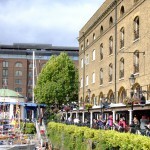 Situated a stone’s throw from the Tower of London and in view of Tower Bridge, there has been a dock at St Katharine’s for almost a thousand years. The modern dock area was built by renowned engineer Thomas Telford in the nineteenth century and became famous for handling London’s most valuable cargoes such as tea, ivory, spices, marble and rum. Only one of the original warehouses – Ivory House – survived the Blitz, but the docks have been redeveloped over the years and are now home to luxury yachts, offices, bars and restaurants. Our visit coincided with St Katharine’s Classic Boat Festival and the Docks were prettily decked out with flags and bunting. MJ and G were excited to see all the motor and sailing boats moored in the dock and to cross the little bridges connecting the different basins. 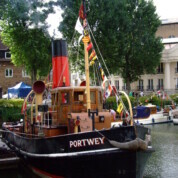 In the Central Basin we had the chance to clamber on board several historic boats – including a traditional sailing barge, a steam tug, a family sailing boat and a fire boat. 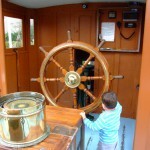 The crews were incredibly welcoming, knowledgeable and kind to the kids – letting them sound the boat’s horn and pretend to steer the wheel and so on. 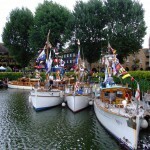 We also got a close-up view of some Dunkirk Little Ships and the Queen’s glittering Diamond Jubilee rowbarge Gloriana. 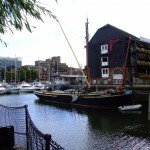 If you are in the area it’s worth visiting St Katharine’s Docks to have a look at some amazing boats, stop for some food and drink in a marina-side establishment, and wander down to the Thames for great views of Tower Bridge. You can watch boats enter and leave the Docks daily through the locks (check website for locking times) and there is a food market on Fridays. Look out for festivals and special events throughout the year – the onboard tours were the definite highlight of the visit for my boys. There are cafes, bars and restaurants dockside and in the immediate vicinity of the marina catering to all tastes and budgets. Also in the area: Tower Bridge, Tower of London, HMS Belfast, More London, Sky Garden, Tower Pier. By train: Tower Gateway (DLR), Tower Hill (Circle and District Lines), Fenchurch Street (National Rail), London Bridge (National Rail, Northern and Jubilee Lines), Aldgate (Metropolitan and Circle Lines). By bus: Bus numbers 15, 25, 42, 78, 100, RV1, N15 and N551 stop nearby.